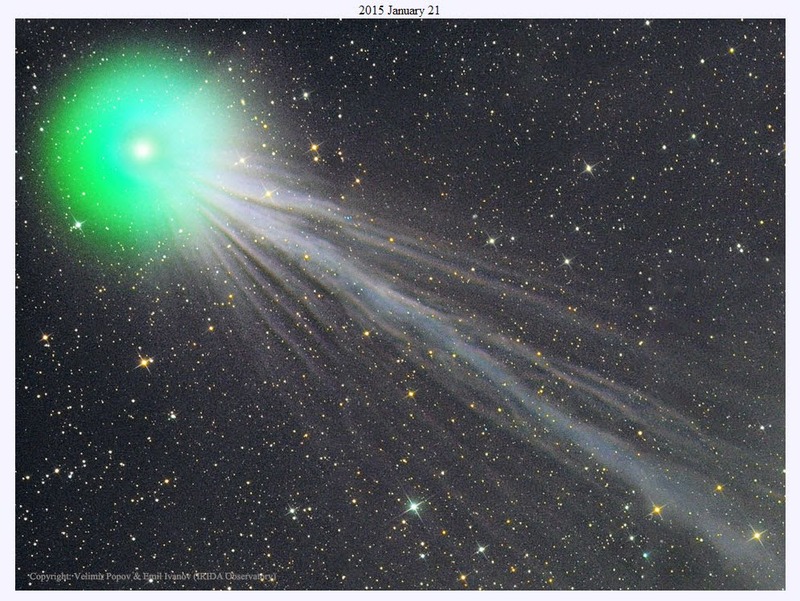 During the past week, Comet Lovejoy has been prominent in the night sky in the Northern Hemisphere. In my neck of the woods (latitude 54 degrees north, in western North America) it has been high in the southern sky in the early evening, a very nice object for binoculars or a small telescope. In a properly dark sky it has been reported to have been observable by the naked eye as well, but that won’t be true in a light polluted city sky. It has been an easy object to find, as it is just a couple of binocular fields to the right (west) of the Pleiades, the attractive star cluster in Taurus. Just find the Pleiades and go a couple of binocular fields to the right and sweep up and down. You should find it pretty quickly, but that won’t be possible for much longer, as it will soon begin its long journey back to the outer solar system. Below is a NASA picture, though it is obviously a lot different from what you would see with visual observing. A long exposure photograph allows a lot more detail to come out. But for my part, there is something magical about visual observations, knowing that the same photons that left the object are the ones striking your eyes. I first spotted it on Saturday night, Jan 17, 2014, through my 7 X 50 binoculars. My initial reaction was “there’s a globular cluster that I haven’t seen before”. I quickly realized my mistake, and that the fuzzy, spread out source of light that I was looking at, was actually the comet. That was ok, but it was a far more awesome on the night of Jan 20, 2014 when I had another look with binoculars. The night sky was very dark and crisp, for the city, with excellent seeing. Stars were just “popping out”. I definitely had a sense of a green colour to the comet and a bright nucleus surrounded by a lighter aura. With just visual observations, I wasn’t able to see a tail, but photos taken by both professionals and amateur astronomers have shown a long wispy tail. Interestingly, Charles Messier came up with his list of 102 Messier objects in order to discriminate comets from other extended sources of light in the night sky (usually referred to now as deep sky objects). He was interested in finding comets (after all, they are named after the discoverer), so he wanted to ignore any deep sky object that didn’t move across the sky in relatively a short time, and therefore couldn’t be a comet. Thus he came up with his list of ignorable objects. Later, it turned out that these other objects were actually more important than comets. They include everything from galaxies with billions of stars, to ancient star clusters with millions of stars (globular clusters), to more recent star clusters with hundreds or thousands of stars (open clusters), to the remnants of single dead stars (“planetary” nebulae and supernova remnants). Comet Lovejoy is thought to have a highly eccentric orbit, that will take about 8000 years to complete. So, it will be a long time until it comes back. That’s true of most comets – comets like Halley’s comet, that orbit in a human life span are very rare. But the fact that comets take thousands of years to complete an orbit is compensated for by the fact that there are millions (maybe billions) of them in the far outer solar system, in the Oort Cloud. Every now and then one will get perturbed in its orbit, and fall in towards the sun to visit the inner solar system. The gravitational perturbations can come from interactions with objects outside of the solar system, like nearby stars, giant molecular clouds or the galactic tides (large scale gravitational effects that stretch the Oort Cloud towards toward the center of the galaxy and compress in the other axes). Other theories that have been proposed include an as yet unseen brown dwarf companion star or a large planet in a distant orbit. The green colour of the comet is due to diatomic carbon molecules fluorescing in ultra-violet light from the sun. Often, the tail has a blue colour, due to fluorescing carbon monoxide ions. The tail, of course, always points away from the sun, due to its interaction with the solar wind. An amusing aspect of Comet Lovejoy is that a Simpson’s episode once featured a comet hurtling towards the Earth. Springfield’s pastor is, of course, named Reverend Lovejoy. He and his wife are in the center-left of the picture from that episode. The Rev isn’t too optimistic about the future. 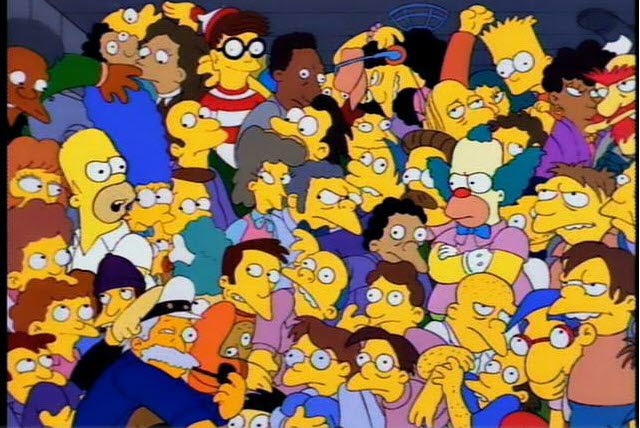 Homer: It's times like this I wish I were a religious man. Reverend Lovejoy: It's all over, people! We don't have a prayer! The dinosaurs probably would have said the same thing as Reverend Lovejoy, if they could have spoken, 65 million years ago, as a comet (or large asteroid) bore down on them.